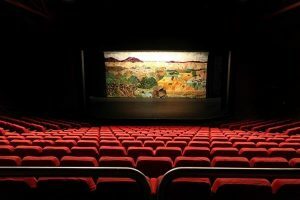 Griffith Regional Theatre has a magnificent soft-sculptured artistic curtain that brilliantly displays our local features and irrigated agriculture. Over 30 years ago, more than 300 of the city’s citizens, ranging in age from 12 to 95, most representing local organisations, stitched and sewed separate sections of the curtain with help from experts. The Creative Craft group tackled the challenging three-dimensional rice crop and three generations of a local family of Italian heritage created the focal point of the curtain, the velvet three-dimensional Dethridge water wheel, the lifeblood of the irrigation area. Viewing the curtain has thrilled the city’s visitors for decades, so don’t miss this unique opportunity. As a plus, one of our members, Bob Barker, who designed the curtain, will be on hand to describe the process’.